Larry Eby must have been a bus driver because he definitely took us to school. From the moment we walked into his jam packed “Corner Store” emporium, until we exited an hour later, class was in session and Mr. Eby taught us well. 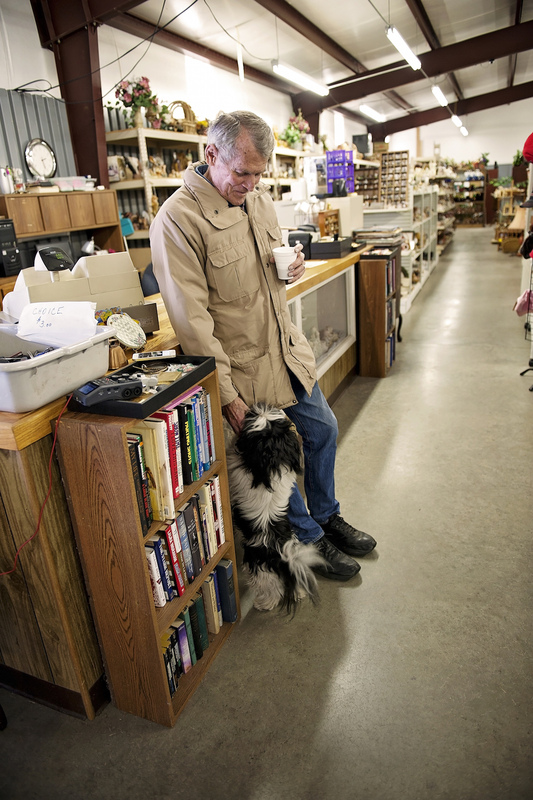 his dog Prince at his feet, our “social studies teacher” covered subjects deeply important to an Oklahoman reflecting on 73 years of change in Adair. He opened with family history. When his eldest son was born (“a fifth generation”), “that child had 13 living grandparents.” 21 years later when his son’s eldest daughter was born, “she was again the fifth generation on both sides of the family.” Then 22 years later when her children were born, they were again the fifth generation on Larry’s side of the family. His eyes twinkled as he told us of his nine great-grandchildren. It was evident while listening that family was important to Larry. His grandmother was Cherokee, and he and his wife still live on her Indian allotment land on an area known as Rock Creek. “I had a convenience store right across the road there, where that car lot is…for 27 years and 8 months, which is almost 28 years (he chuckles). I had got to the point where I had run off most of the help, and it was just me and a woman who run this store. And I went down one morning to open the store, and the first 3 or 4 people that came in were – to say the least – not very nice. “When I was young, the older folks lived on their homestead places, 160 acres, and there were 2-4 homes per section. Now their kids have sold off those homesteads into 5,10 and 20 acre plots, and there are trailer houses all over ’em, and there’s not any amount of land that people farm around here any more. School was out and we drove down the road with Larry’s stories in our heads. I had an inclination to go fishing and take steps to rebuild the quail population in Mayes County. Rachel was sharing a story about Larry’s wife happening upon a mother lode of Depression glass and how they brought it back to Oklahoma. Finishing her second official stop, April was beginning to grasp what our project was all about. And on we traveled…to the next little town whose buildings were shorter, and businesses were almost non-existent, and we wondered what the area might have been like had toll roads never been built. Here’s a link on cool Adair history. And, here’s an even better one. The Oklahoma Historical Society always wins against Wikipedia. April apologizes for the “Strang” slide in the Adair movie above, and will change it as soon as she returns from Haiti. Rachel really wants this lens if any philanthropic readers happen along and feel generous. This is my favorite picture of Larry Eby, “social studies teacher” and owner of the Corner Store (wonder emporium) in Adair, OK. I stopped by last week and got a cute toy for my grand-nephew Eli. It was good to see Larry and Pat again.